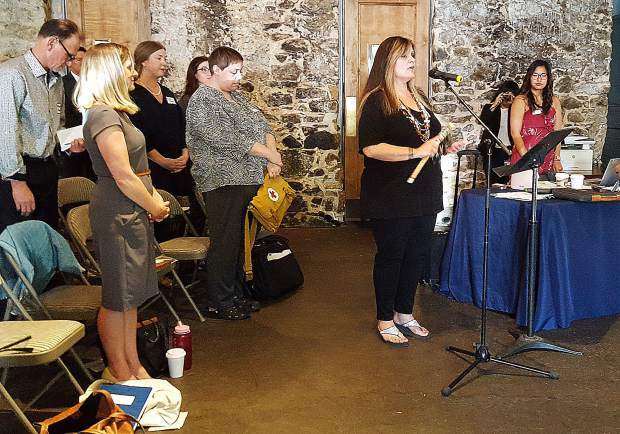 Shelly Covert, the spokeswoman for the local Nisenan, sings a song of welcome to kick off the California Arts Council meeting Thursday at the Miners Foundry. For more information on the Nevada County Arts Council, go to www.nevadacountyarts.org. Nevada County’s art community got a once-in-a-lifetime opportunity to have its collective voice heard Thursday, when the California Arts Council held one of its five annual public meetings at the Miners Foundry. Close to 140 stakeholders packed the room in a graphic demonstration of just how rich and diverse the arts scene is in Nevada County. Speakers during public comment included Jesse Locks of the Nevada City Film Festival, Amber Jo Manuel from The Center for the Arts, Yuba Lit founder Rachel Howard, Julie Hardin from InConcert Sierra and Amee Medeiros of Neighborhood Center for the Arts. Many referenced the hard work of Nevada County Arts Council Executive Director Eliza Tudor, who helped spearhead the push to have Truckee, Grass Valley and Nevada City designated as California Cultural Districts and who hosted the meeting in conjunction with the Miners Foundry. And speak out they did, stretching public comment well into the lunch hour. Artist Ruth Chase told the council that Tudor was a big help in becoming a working artist in her own community. In a small town, many artists often feel very removed from the larger art world, she said, adding that for many years she had to seek projects and funding in Los Angeles. “Conceptual art is not something that usually goes with rural counties — or so I thought,” Chase said, referencing a “discouraging” 16-year span of living in Nevada County and not being able to make a living here. Locks and Michelle Amador, who works for Brooklyn-based Mark Morris Dance Group, highlighted the cultural district as a way to leverage better representation on the statewide and national arts stage. California Arts Council Vice Chair Larry Baza called the public comment a highlight of the meeting, citing the robust turnout. After the meeting, Tudor called the council meeting a coup for Nevada County.